Learning how to become self sustainable one day at a time. With the drought that we are experiencing watering your garden is a real chore. Drip irrigation is a must in your garden. Gardening in drought conditions is difficult, especially now that severe water restrictions are in place. The drought has the added effect of increasing the cost of fresh fruits and vegetables, so home gardeners are turning to their own gardens to feed their families. The only problem now is that cannot use hoses and sprinklers to water these cost saving gardens. Buckets are not efficient and the only reason you can use them is that the labour required to carry buckets is the disincentive to water the garden. With drip irrigation, that issue is solved as you are able to precisely water your plants and there is no wastage. This is our story on how we saved close on 90% of our farms water consumption as well as thousands of Rands every month. Looking down a newly planted line of tomato seedlings. For a long time Livingseeds Farm relied on a patchwork of different sprinkler systems in our fields. These sprinklers where bought with small fund allocations, as and when we needed to expand. They were made up of 3 or 4 disparate makes that just never did exactly what we needed them to do. As we irrigated from a borehole, if we needed to run the sprinklers, it would run directly off the borehole pump. So, if we wanted to water just a small section the borehole pump ran. We found that to ‘save’ on the electricity that was being used, we would actually over-water certain sections, and this had its own set complications with diseases, over-watering etc. In the spring of 2010 we made the move from overhead sprinklers to drip irrigation. The outlay was painful for the first month, however it was a real eye-opener over the next few months. We also doubled our planting area at the same time, as I figured that we may as well just bite the bullet and roll out a larger drip system in one go. Combined with a regular and heavy mulching regime, drip irrigation could see you saving close on 90% of your vegetable garden watering bill. 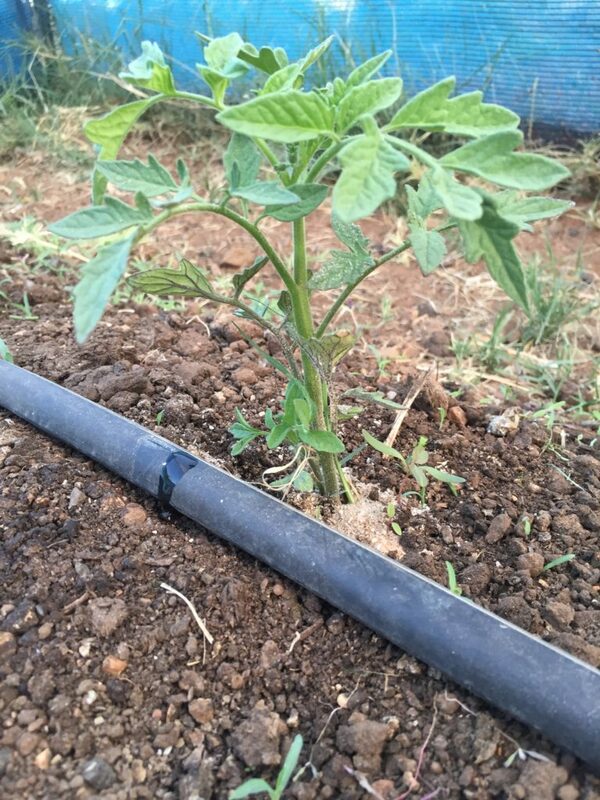 An heirloom tomato seedling flourishing with drip irrigation. 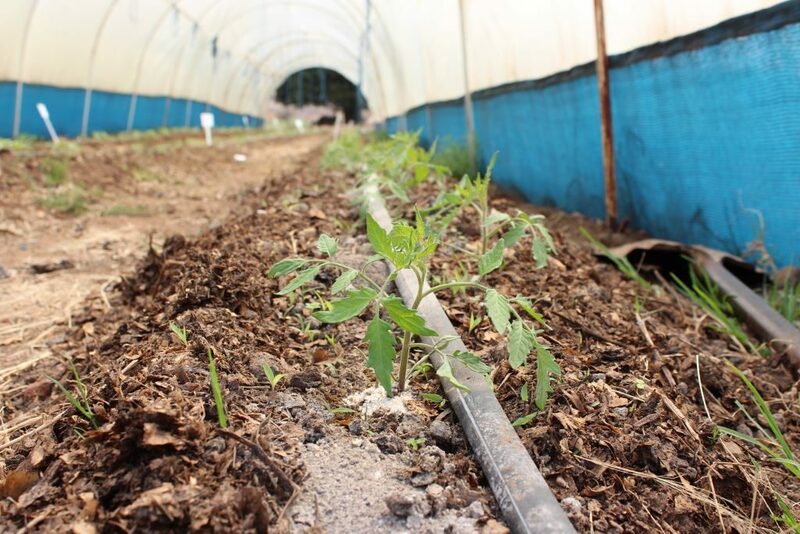 So, to say that we are a little biased when it comes to drip irrigation is an understatement. Our system has been designed around agricultural grade drip system. We have used this grade system on Livingseeds Farm from the last 6 years and apart from the occasional punctured line, they are still operating flawlessly. Our winters can drop to -15 and our summers peak at 40+, so you can rest assured that this is not a cheap retail grade drip system. The emitters run at 1lt per hour at 1 bar, the water is directed at exactly the point that you want it and there is no wastage. Because it only runs at 1 bar, there is no need to open your tap to full pressure, just a slight opening of your tap will give you more than enough pressure to run this system. The kit comes with a full colour 13 page manual that will help you install your drip system in a matter of hours. ← 2017 Livingseeds Vegetable Exhibition. Is it possible to rather have the parts specified in price so that one could purchase a system that fits your requirements? Hi Chris. We will look into this in the next week or so. I live in Nelspruit ! Where nearest a available supplier ? We are an online store. You will need to order here. Hi Pat, what advice do you need? Would this product be sufficient for an established garden? I’m wondering if one has to plant next to the holes or can one insert holes where the plants are? Hi there, nope, the holes are set and have a specific emitter to release water, making a hole in the drip tape will not work. Once the drip is running for about an hour there will be continuous wet soil the entire length of the drip line. They will work for established veggie gardens and the water will get to all the plants, as long as the line runs past the plants. Are you using a header tank? That would save a lot of electricity. The system does need to use a header tank, and no electricity is used, with or without a header tank. Hi there, I have raised veggie beds in my home garden. Would this drip irrigation still work as i don’t have rows. I have about 5 raised boxes. Qould I be able to customize it if that makes sense. I started veggie gardening last year, and thus have a lot to learn. You mention the “emitters” run at 1L per Hr. Emitters = the points where the water drips out? 1L per Hr, seems a lot. I water my veggies by hand. Transplanted seedlings about 1/2 L per day. Fully grown plants being harvested about 1L per day, always in the morning, and I got a really good yield of veggies last year. Turnips and sweet peppers about double the size of department store ones. Broccoli heads about 1.5 times the size. Am trying beetroot, carrots, spring onions, runner beans, Swiss chard extra this year. Thank you for your comment. Your produce sounds fantastic. 1L per hour is an industry standard. Note that all of this water is dripped directly into the soil and it does not run off along the soil surface. Drip typically runs every 3rd or 4th day for around 2 hours. So looking at your usage that immediately a 50% water saving at the least. What do they cost and how do we buy them? I don’t know how to measure the sqm. It’s a 22m long bed that’s 30cm wide. The smallest kit comes with 30m of tape so it would fit your requirements perfectly. Please see here for kit details. Livingseeds, is the best heirloom seed company. Succession Planting: Do it correctly.